Friends, family, and community said farewell to Ken Gray on Saturday, at a memorial service and tribute to Ken held at the Marina United Methodist Church. The culmination of the service was an incredibly affecting rendition of Ashokan Farewell, played by Sara Arnett and Al Friedrich. Click the link to listen to another, but also affecting, version of this wonderful music. Ken was a State Park employee for 36 years, serving as Senior Park and Recreation Specialist in Monterey County until his retirement in 2009. He was instrumental in efforts to establish the Fort Ord Dunes State Park. He was devoted to his family, and was a Boy Scout leader, and served on the Board of the Thomas Carman Food Pantry. Deeply embedded in his community, Ken was greatly loved, and will be greatly missed. I knew Ken Gray because starting in 1998 he spearheaded an initiative effort in the City of Marina to establish an Urban Growth Boundary, the first ever in Monterey County. Ken is pictured above in front of the land that would now be a sprawling subdivision, had Ken and others not stepped up to propose a different vision. As the Executive Director of LandWatch Monterey County, I worked with Ken and a small band of community activists on this important effort to enact a land use measure that has prevented urban sprawl onto the open space and agricultural lands surrounding Marina. An environmental planner by training, Ken well understood that it is important for local communities to decide when (and where) to say "no" to the development proposals that always promise money, jobs, and new community opportunities. Our human intrusions into the World of Nature face no built in limits. We need to limit ourselves. We need to be able to abstain, and let Nature alone. After all, in the end, it is the World of Nature that sustains us. Ken also knew the word "yes." Measure E, that enacted the Marina Urban Growth Boundary, was not an easy "sale" in the political climate of the year 2000. Many community leaders in Marina opined that establishing such a growth limit was "impossible." Ken called together activists in a local group called Marina 20/20 vision," and they crafted a measure that established a boundary, in the year 2000, that will last until 2020, and that can be extended thereafter. Ken knew, and the the others who worked with him knew, that there is no built in limit to what we can achieve, but that if we want to create something new, and to do something new, we must say "yes" to possibility. We need to "try." 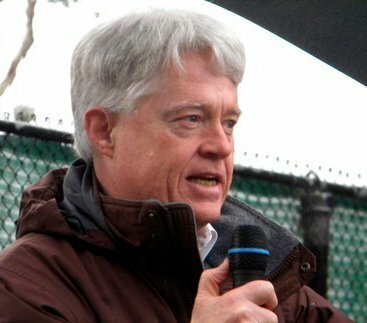 Ken Gray's willingness to "try" to establish the Urban Growth Boundary that was enacted fundamentally changed the community life of Marina, because the success of Measure E, in the year 2000, let everyone in Marina see that community-based politics could literally change the world. How and when to say "yes" and "no": these are two great lessons from Ken Gray. He is, already, greatly missed.